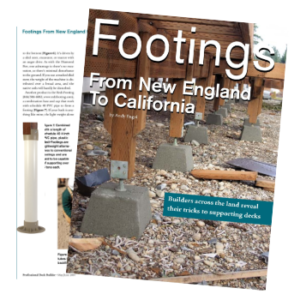 Redi-Footing is a PVC based alternative to poured concrete footings for decks, fences and other forms of light construction. It offers low costs, less labor, proven structural strength. Unlike concrete, it isn’t weather or temperature dependant during installation. Footings can be easily relocated if necessary. Over time, concrete footings can degrade from temperature induced spalling (pieces break off from the concrete), salt and other soil components, and rusting of steel components. Redi-Footing has none of these drawbacks. 1. Cut schedule 40 PVC pipe to length (determined by local code according to average local frost lines). 2. 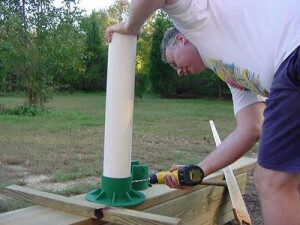 Insert PVC pipe into base, using a hammer and the block of scrap wood. Feel for the pipe to bottom out in the base. 3. Drill ¼” holes through the base and pipe walls on opposite sides. These allow air to escape during the next step. 4. 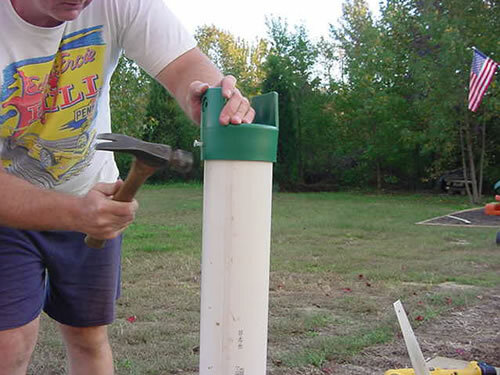 Attach the upper cap to the top of the PVC pipe, using the hammer and block of scrap wood. Make sure the pipe seats completely inside the cap. 5. Drill two ¼” holes through the upper cap and pipe walls. 6. Using a hammer, insert the stainless steel pins into all four ¼” holes. Here are all the parts and the tools you’ll need. 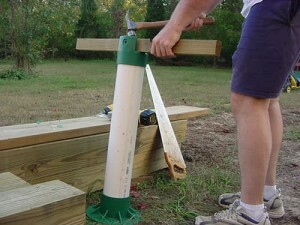 After the PVC is cut to length according to local codes (based on frost-depth), put the 4″ pipe into the footing base. 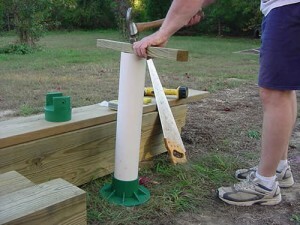 Make sure the pipe touches the bottom of the base by tapping with the scrap wood. Drill holes through the base and into the PVC. This is where you’ll insert the pins with your hammer. 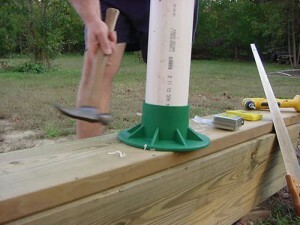 Tap the pins into the footing base with your hammer. These pins prevent uplift, which is a code requirement no matter where you live. 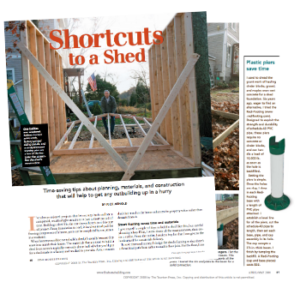 Using your scrap lumber and hammer, tap the cap over the footing. Make sure it rests completely and sits flush on the schedule 40 PVC. 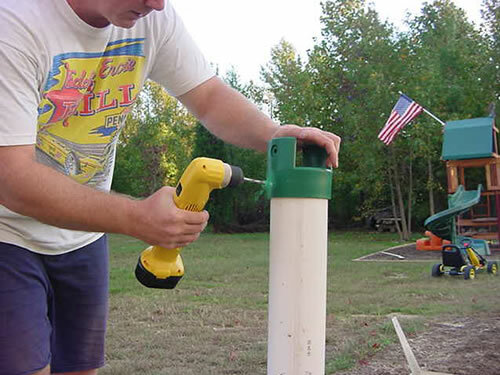 Drill your holes into the cap and pipe to install your pins. Tap the stainless steel pins into the two holes of the cap. 1. Dig your holes so that the bottom edge of the upper cap will be at ground level. 2. Fill the holes around the Redi-Footing so that each footing is plumb and level. 3. 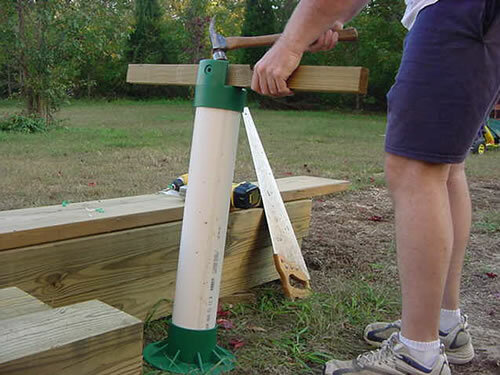 Attach posts to the Redi-Footings with the galvanized lag bolt supplied. 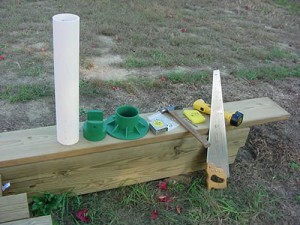 A 4×4 treated post will fit directly between the ears on the post cap. You are done with your footing installation!